Looking for an easy, non-messy solution to get a better grip on your guitar picks? Try out our new solution– PickTac! 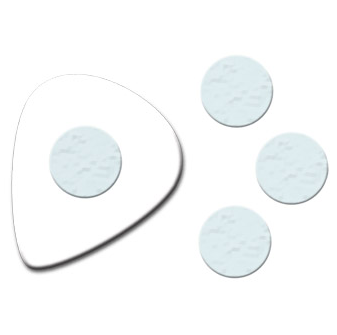 PickTac is an adhesive dot that you can peel on one side to stick on your pick and then peel the other side to have an instant grip that will not move or shift. Because of it’s versatility, you can place the PickTac anywhere on the pick that will best suit your playing needs. As your hand heats, the PickTac will start to mold to your finger for a customized grip. If you need to remove PickTac, just pull up on the PickTac, and it will cleanly remove. PickTac allows you to easily reposition your fingers as needed and leaves no messy residue on your pick or your fingers. You’ll find it to be truly PickTacular! PickTac comes in a package of 50 dots for just $7.99!! To place your order for PickTack today, visit http://www.steveclayton.com/picktac.php. Check out these rockin’ custom picks! We really liked the Heartbreak Beat design that was printed on our pink delrin material picks. When we looked into it further, we found out that they were made for a clothing company! The best part is that Heartbreak Beat makes clothes specifically to appeal to musicians. The company was “founded by musicians, for musicians and anyone who just digs the ‘rock & roll lifestyle’, for lack of a better term.” Employees of the company also play in bands themselves. 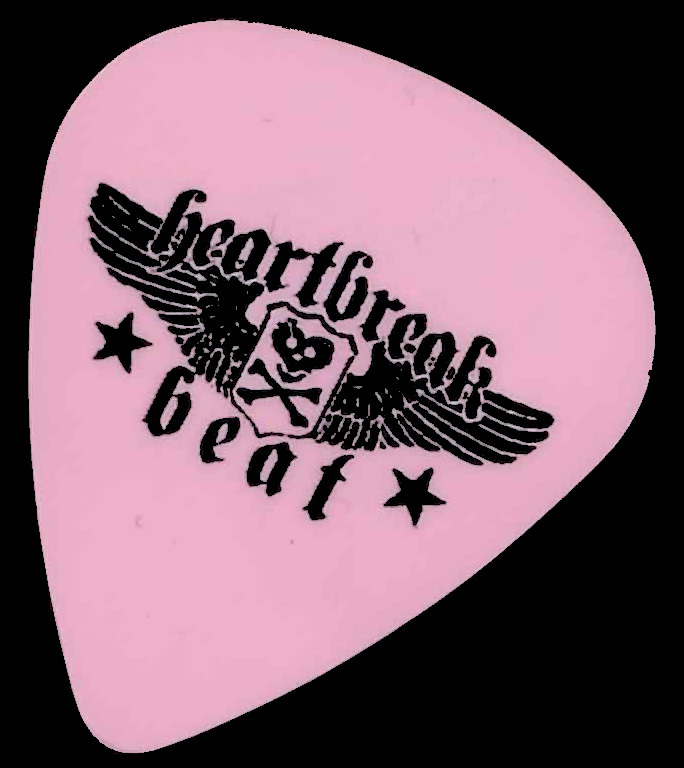 “In addition to their own line of tees, Heartbreak Beat does limited-edition tour shirts for the likes of Alkaline Trio, Cheap Trick, Cake, and others.” Check them out at http://www.heartbreakbeat.com. Design custom guitar picks like these to promote your company today! Visit www.claytoncustom.com to get started. 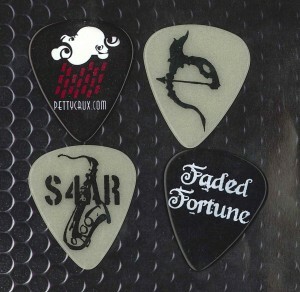 Looking for a new type of guitar pick that will keep up with your playing? Duraplex picks are named for their durability, and they live up to their expectations! Duraplex are strong and will stand the test of time. The edges of Clayton Duraplex are polished to avoid being held back by annoying tabs. The material is ultra-high quality that is resistant to notching. As a guitarist, you know what you want from your delrin material pick, and Clayton Duraplex will take you a step further! Available in six traditional gauges/colors (Red/.50mm, Orange/.60mm, Yellow/.73mm, Green/.88mm, Blue/1.0mm, and Purple/1.14mm). Also available in each gauge as standard shape, rounded triangle or small teardrop. May be ordered in packs of 12 or 72 picks, or in a starter display set on our site; http://www.steveclayton.com/delrin.php. We decided to showcase a couple of really nice overbleed custom pick designs. Overbleed, or full bleed, is an option for custom picks that allows you to create your design so that the art, graphics, photos, text, etc. will extend all the way to the very edge of the pick, instead of having a border around them. This simple change in the normal design process will allow for some really cool effects, like the picks shown below. 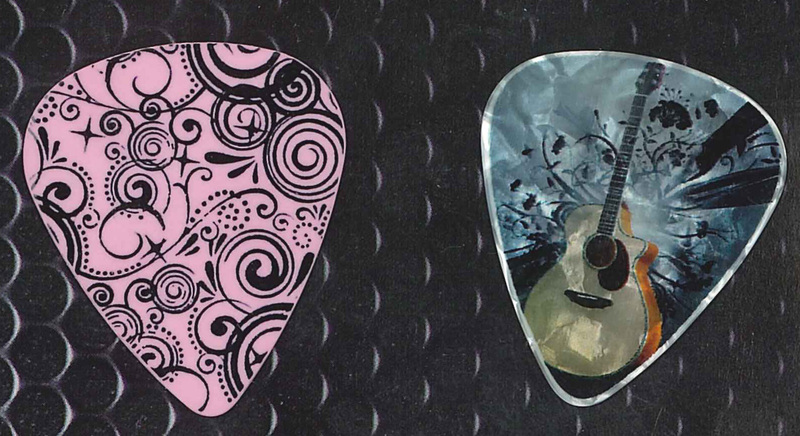 The pick on the left is our pink delrin material, and we like how the black design creates the effect of a patterned pick. The pick on the right is a white pearl, and the full coverage of the background in the art creates an illusion that the pick is colored instead of white, and has a really nice gradient. 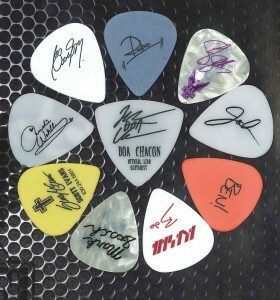 To have this option for your own custom picks, simply visit www.claytoncustom.com and start your design. When you reach the pick options page, you will see a box to the right that you can check to allow for the full bleed of your design. When you click this box, you will notice that the template on the next page will not include any border around your design. 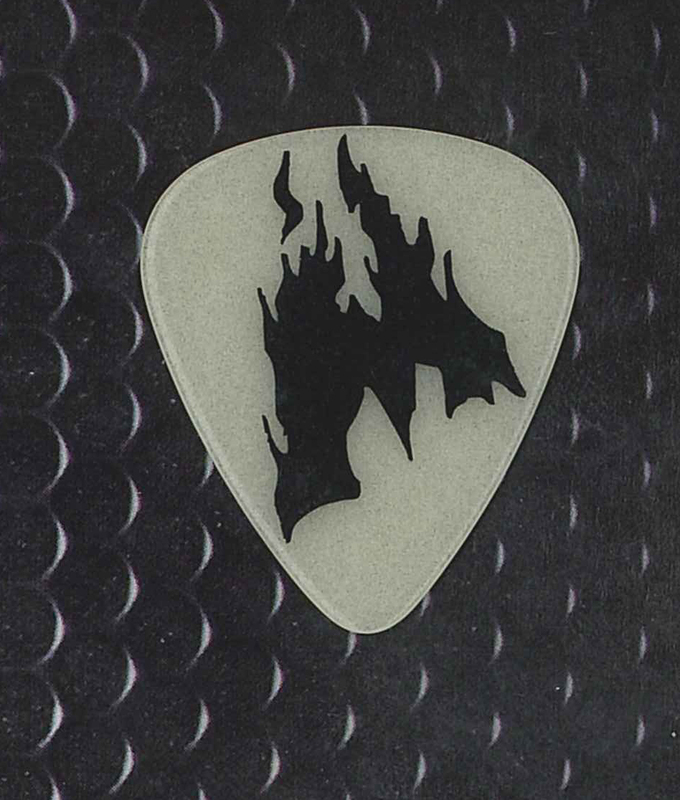 Just as a caution though, it is inadvisable to create a design that has a black full bleed background on a white guitar pick…these types of designs are highly susceptible to flaking once they are on the picks, and they often make the artwork appear muddy. Happy designing! They provide the service of wire wrapping your pick and attaching it to a comfortable leather necklace. The wire wrapping will securely hold your pick WITHOUT requiring any damage to the pick (example: making a hole through the pick). 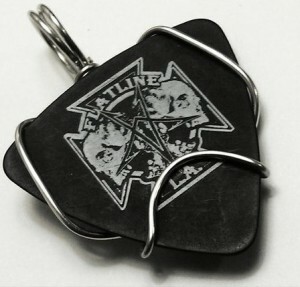 Keep in mind that the company does not provide the actual picks, so the best way to Pimp Your Pick is to create and order some custom picks from Clayton, Inc., at www.claytoncustom.com, and then get your necklaces made! Looking for a new twist on your custom guitar picks? Try out our glow in the dark picks!! They are one of our newest items available for customization. Shown here is an example of a cool fire design that one of our customers created to have on glow-in-the-dark material. 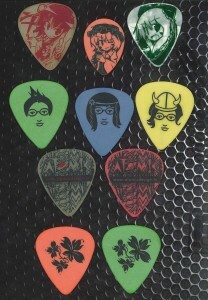 These picks are great for eye-catching give-aways at concerts! They are available in thin (.50mm), medium (.80mm), and heavy (1.0mm) gauges. Bear in mind that they can only be customized with black ink artwork, so it is best to have your design created in black only…our customer service reps are happy to convert artwork to black if you are unsure about how to do so. 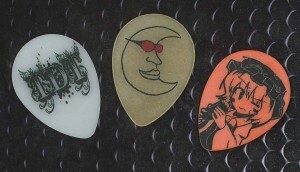 Design your custom glow in the dark picks today at www.claytoncustom.com!! Looking for a fancy upgrade for your custom pick guitar picks? Try out our hot stamp foil picks! Hot stamp is a different type of printing method that allows for an embedded foil stamp instead of a regular ink print. We have these picks available in three gauges, and in eleven different pick colors. All of the pick types are celluloid material, and they are a glossy finish. The can be printed with gold, silver, red, or purple foil. Shown here is an example of a hot stamp foil pick that was created by one of our customers. This is for white pearl picks, with a gold hot stamp foil. Try out your hot stamp foil pick design today at www.claytoncustom.com! Sometimes, the simplistic designs are the ones that look the best when it comes to custom guitar picks. Shown in the image below are some great examples of simple but awesome designs that were submitted by our customers. These were all created on our white delrin picks. White delrin material is a really nice, bright white that looks great with colors, or with black-only designs like these. White delrin picks are available in standard guitar pick shape, and in three gauges including .80mm, 1.0mm and 1.26mm. To create a cool black and white design like the ones in the image, visit www.claytoncustom.com today! Well, Valentine’s day has come and gone, but we wanted you to see some of the cute designs that we got from our customers! Custom picks with photos on them can make wonderful gifts. All of the picks shown in the image below were created on our white pearl material, which is often the best for photo designs. White pearl picks have a marbleized quality to them, which gives a classy look and also makes the images on them have a 3-D quality. These types of designs have been very popular lately, both for Valentines day and for wedding guitar picks. Try out your own design at www.claytoncustom.com today! We wanted to draw some attention to these very nice, classy-looking pick designs that we have received recently. The pick on the right is one of our white pearl picks, which is a marbleized, glossy finish pick. The design is very elegant, and was created for a wedding, so our pearl material was a perfect choice. 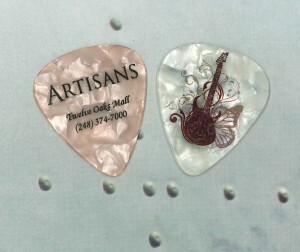 The pick on the left is a colored pearl pick, created for a jewelry store. They were looking for a gold color pick, and we were able to custom match the color according to their specifications, and we thought that they came out very nicely. Seeing these two pick designs together, and how the colors of the picks and the designs compliment each other gave us a good idea to share with you. If you are celebrating a wedding or other formal event that you are planning to use custom picks for, choosing both our white pearl picks and our colored pearl picks is a great way to go. Both picks have the beautiful marble quality, and the design for the white pearl picks can be matched with the color of the other picks, just like the two picks shown in the image. If you would like to try out this idea, you can place multiple orders at www.claytoncustom.com. Start designing today! Love Your Custom Picks on Valentine’s Day! 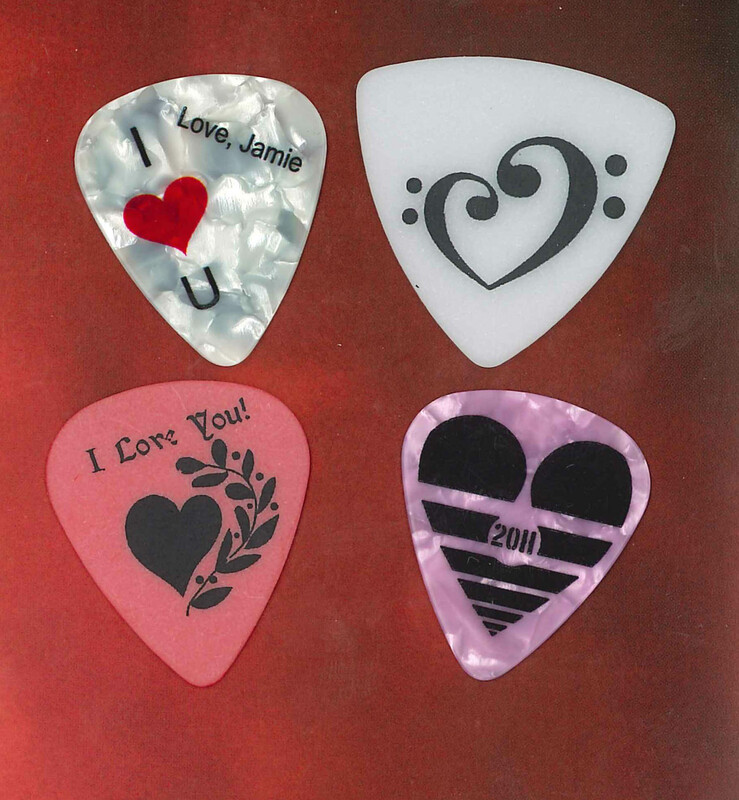 Valentine’s Day is quickly approaching, and the time to order custom guitar picks for the occasion is now. Maybe you are trying to find the perfect gift for that guitar-player in your life? Personalized picks are both useful and special. 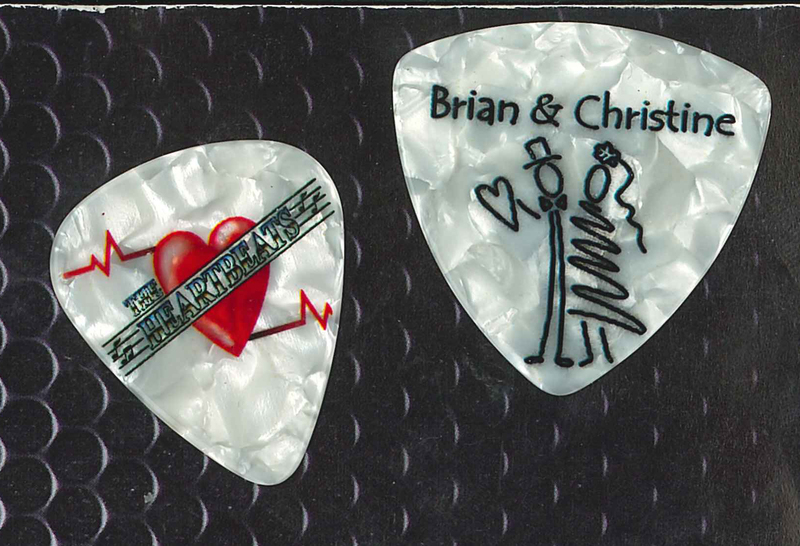 Other uses for custom picks could be at a Valentine’s Day party, or as give-aways for a V-Day concert. 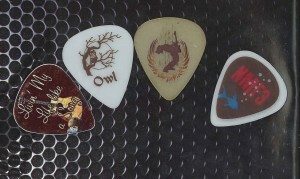 Shown here are some examples of custom picks that some of our customers have created. 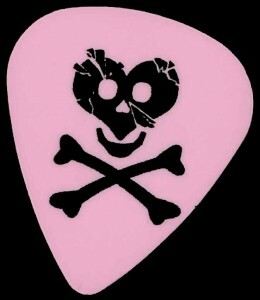 This image includes a white pearl pick with full color design, an acetal rounded triangle pick with bass clefs used to create a heart, a red delrin pick, and a pink colored pearl pick. Hopefully, these picks will give you some ideas to get started on your own romantic designs. Create your custom design today at www.claytoncustom.com! 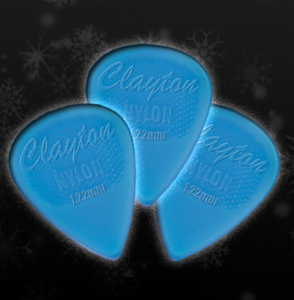 At Clayton, we are always trying to discover new ways in which our customers use custom picks, and also learn about what types of events that guitar picks can be used for. 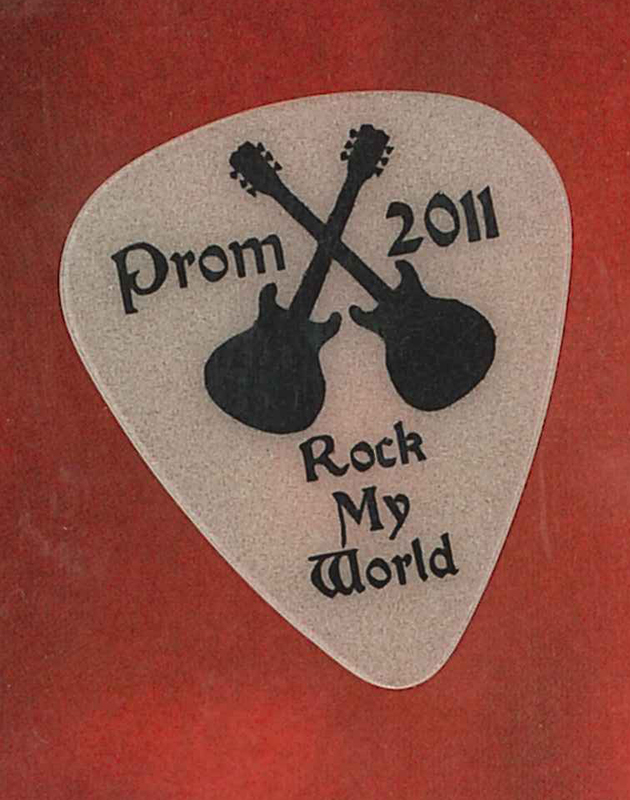 We recently had a design created for a prom, which was a new idea that we had not seen in a custom pick order before! We thought it was a great idea. An image of these picks is shown below. They they were done on our glow in the dark pick material, which is a perfect choice since the picks can be used for decorations, and the glow quality will stand out in a social dance setting that probably has low lighting. So, we wanted to introduce this idea on our blog! We know that proms normally happen around May, but planning for them can take the whole school year. If you are involved in planning a prom, why not create a rock and roll theme, and use custom picks as decorations and take-home mementos? Create your custom prom pick design today at www.claytoncustom.com. Today we wanted to show off a couple designs that were recently created and made on our black celluloid picks. Black celluloid is a somewhat new material for Clayton…it was added for custom design last year because we discovered that these picks can support some really nice designs, including ones with varying colors and sometimes intricate detail. Black celluloids are a glossy finish pick, and we have them available in three gauges; thin, (about .50mm) medium (about .80mm) and heavy (about 1.0mm). They can support single color white designs, or full color designs such as the ones shown below. We wanted to draw attention to these specific designs, because the customers who created them used a “glow” effect that makes the text look like neon lights, which happens to show up really nicely against the black background of the picks. 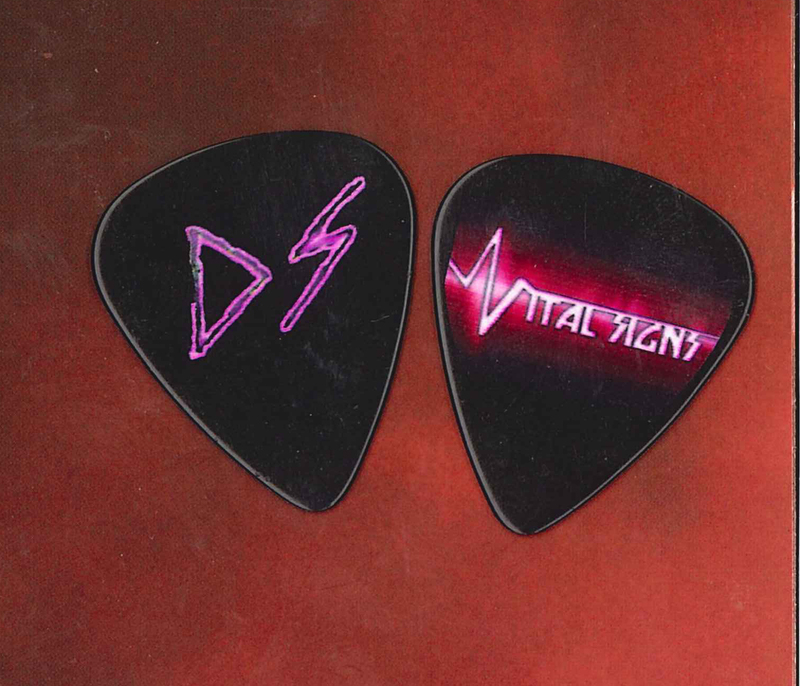 So, if you like the look of these examples, check out our custom guitar pick design site and play around with your own black celluloid design today! Are you wanting to design some custom picks, but don’t know what to put on them? 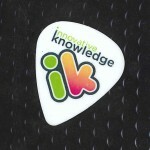 If you have recorded an album of your music, simply putting your album art on your guitar pick can be a great option! Shown in the images below are examples of some picks that have album artwork on the front side of the pick. As you can see, they have turned out wonderfully. They all have a lot of color and detail, but it all shows up well on the pick. These can be a great give-away for fans too! All of these designs were put on our acetal pick material. Acetal is semi-transparent white, and is the best material for complex art like the album art show in this image, and is also great for photos. 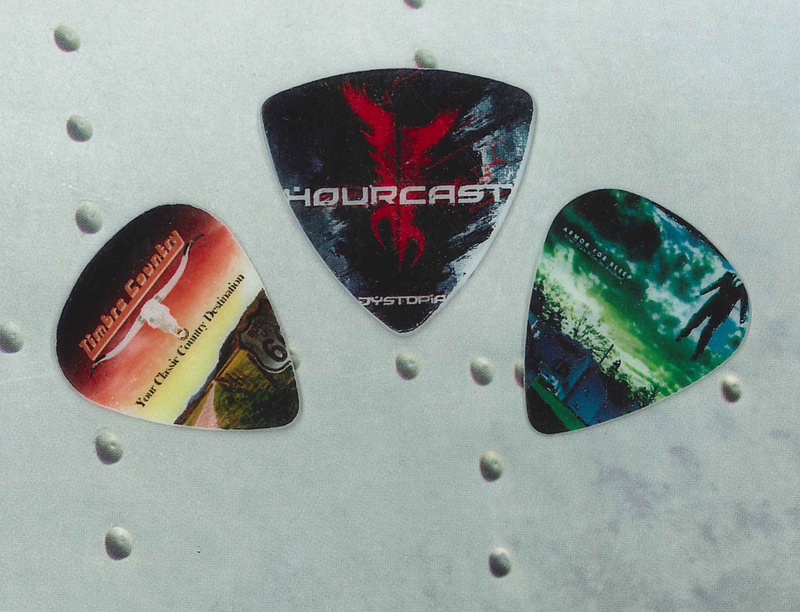 Acetal is known for being a high-grade, professional pick material that is resistant to slipping, so your cover art picks will also be great to play with! Design your custom guitar picks using album artwork today at www.claytocustom.com! Hey Clayton customers! 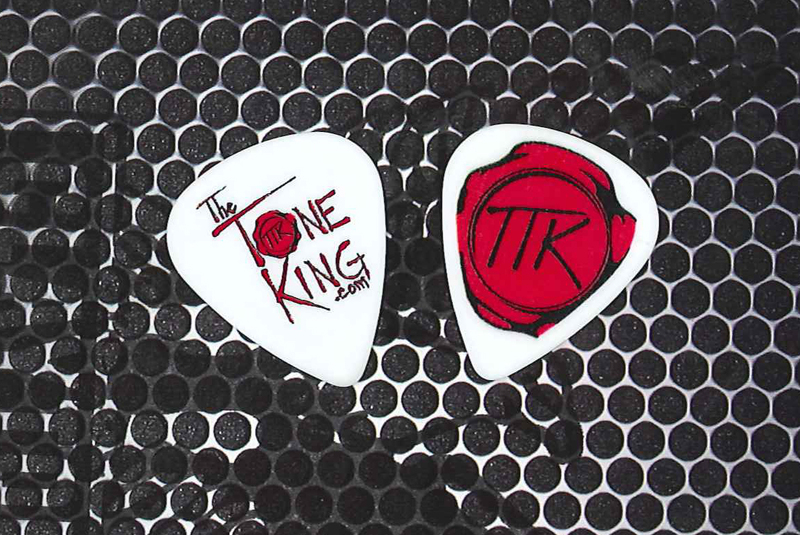 We know that many of you are probably planning to order some custom guitar picks to give as awesome gifts for the holidays! We just want to help you be a little prepared. We have some specialty picks that are very popular, but they take a while to produce so we want to make sure that you include production time in your planning. If you are looking at ordering black celluloid, hot stamp foil picks, or glow in the dark picks that are needed by Christmas day, the deadline to place these orders will be next Monday, November 15th. So start designing today at www.claytoncustom.com! 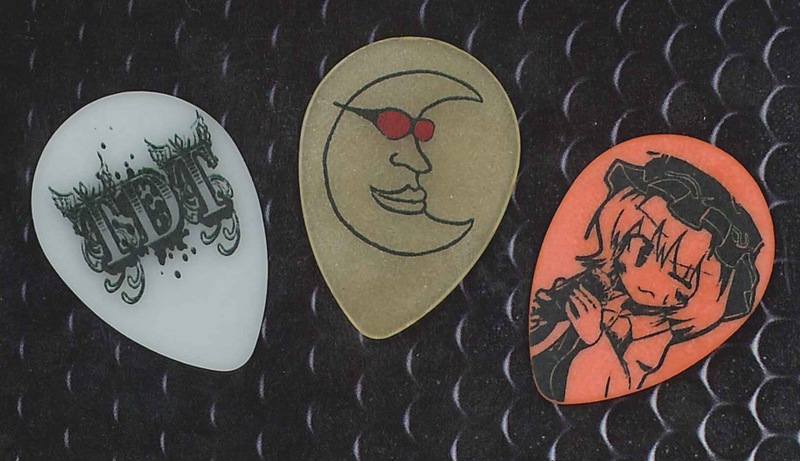 (see example designs below for black celluloid and glow in the dark picks) If you are ordering pick materials besides these three specialty materials, you will still want to be aware of final order dates to get your picks on time. If you choose standard shipping, you will need to place your order by December 16th. For priority mail, the deadline is December 17th. For Second-Day Rush, it will be the 21st, and for Overnight Rush, it will be the 22nd. So, don’t let the holiday season sneak up on you! 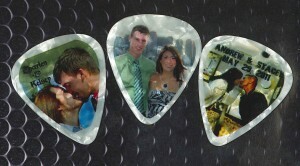 Place your order for custom guitar picks today! 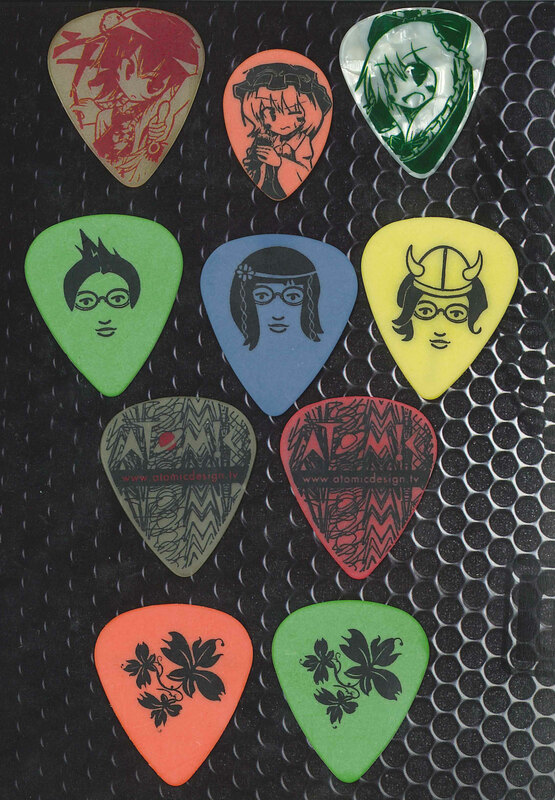 This week, we wanted to draw some attention to our custom teardrop shaped picks. Many of our custom pick materials are available in three different shapes; rounded triangle, standard, and small teardrop. We often have customers request picks that are best for playing jazz music, and teardrop should be the first choice! The small size offers a quick response when playing, and the slightly rounded tip will provide a warm tone. We have this shape available in a variety of materials, including ultem, acetal and colored delrin (several gauges available as well). 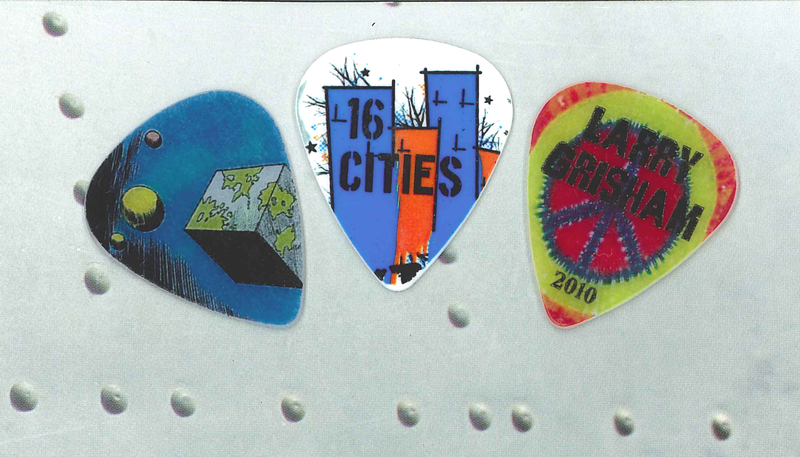 Despite the smaller size of the teardrop shaped picks, we have had some great designs submitted to go on the picks. Shown here are examples of small teardrop custom designs on each of the materials offered. Left to right in the image, the materials are acetal, ultem and orange colored delrin . Design your teardrop pick today at www.claytoncsutom.com! Sometimes, there just isn’t enough space on one side of a guitar pick to put everything you want on it, especially since guitar picks are so small! This is why we offer the double-sided printing option for most of our guitar picks. This opens up a whole new world of possibilities. 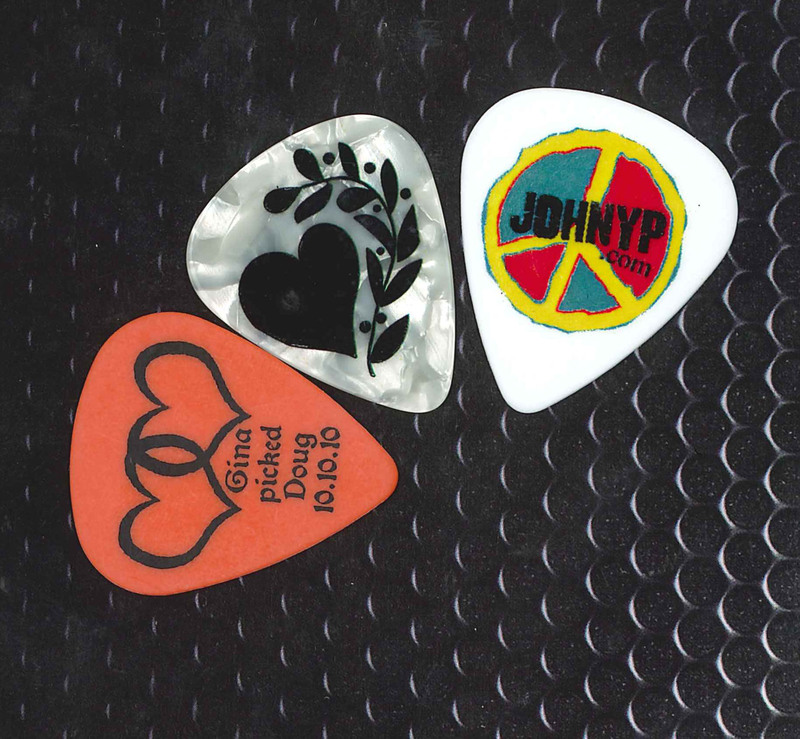 Shown in these images are examples of double-sided guitar pick designs. The blue design is on our acetal material pick, and the customer chose to just duplicate the same design on both sides of the pick. The green design was done on acetal material as well, with a band logo on one side and a signature on the other. This is an awesome idea, because then you can order picks for several band members with the band logo on one side, but different signatures for different musicians on the back side. We don’t always recommend double-sided printing for our acetal picks since they are semi-transparent, but on both of these picks, the designs came out really well. The red design is for a wedding pick, and it is on our white pearl material. Double-sided printing is perfect for weddings, because you can have a graphic on one side of the pick, and the names of the couple and date of the wedding on the other side. 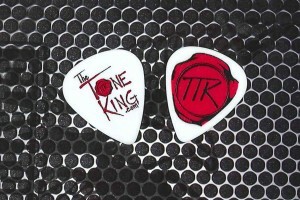 To utilize the double-sided printing option, all you have to do is access our guitar pick designer at www.claytoncustom.com. Once you choose the pick material you would like, the interface will list your guitar pick options. If you mark the bubble for two-sided printing, you get twice the design space! 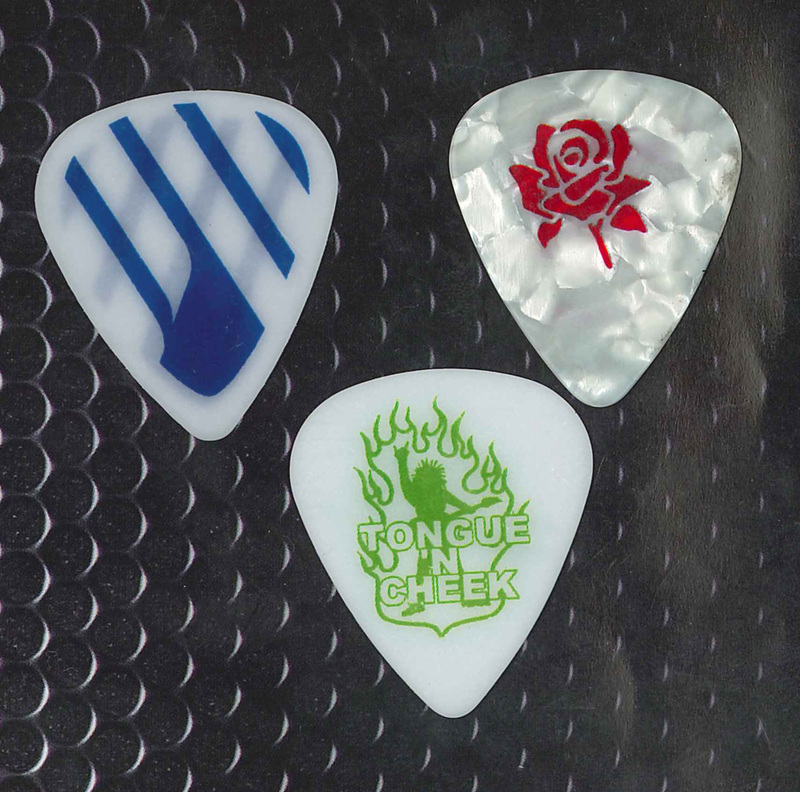 Using our Graphics for Your Custom Picks! 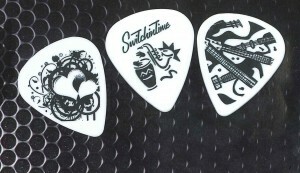 Thinking of creating a custom designed guitar pick? We wanted to let you know that we have a lot of graphics available in our design interface that you can use to help create your design! 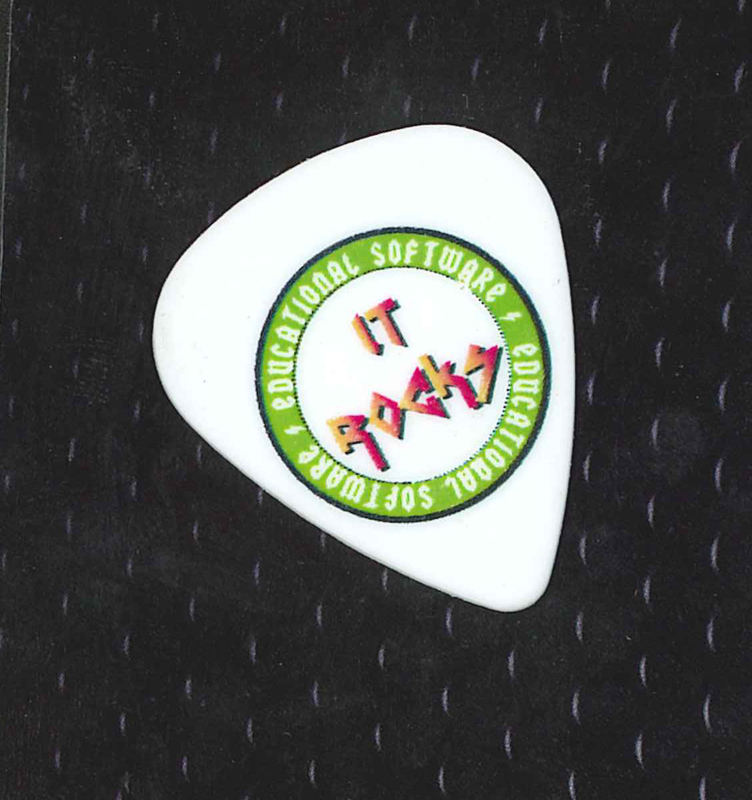 Some of our customers have specific logos that they want to upload into the design template, but others just want something really cool to put on their picks! Shown in this image are some examples of how customers used our graphics to create their designs. Included here are an orange delrin pick, a white pearl pick, and a white delrin pick. You can easily access our full library of graphics on our website. Start by going to www.claytoncustom.com, and clicking on the “Start Now” button. Once you choose your pick options, you will come to a window with a blank guitar pick. If you click on the “Add Image” button, you will have the option then to use your own graphic, or one of ours! We have many categories available for the graphics, including wedding, religion, shapes, nature, animals, and, of course, music! Explore the design possibilities on our website today!! 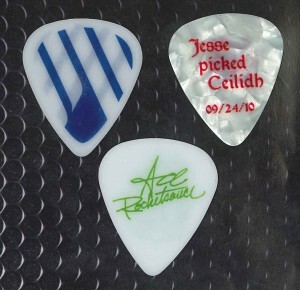 We wanted to show off a few of the really cool designs that customers have created recently for custom guitar picks. These are customers who did not hold back when designing their picks; they have a lot of color and detail and they all came out great on our picks! These customers all chose the “full bleed” option for their guitar picks. This means that, instead of having a small border around the artwork, the design will bleed right to the edge of the pick. It is a little bit more expensive to choose this option for custom picks, but it is well worth it to have designs that are as awesome as these. Most of our pick materials include the overbleed option. The pick materials shown here are white delrin (the middle pick) and acetal (the two outside picks). These materials are great for full bleed because they also allow for full color designs, so you can let your imagination run wild. 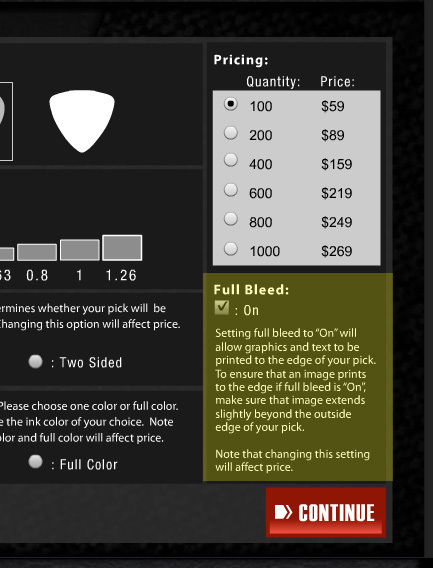 Design your custom guitar pick on our custom design site today, and try out the Full Bleed option! Here at Clayton, we offer three different white picks for custom design, including white delrin, acetal, and white pearl. If you are looking for a classy pick that is great for playing, or for use as a promotional tool, white pearl is optimal. Our white pearl picks have glossy finish, and they are marbleized, so they automatically have the “upscale look.” White pearls can be great with either single or full color designs, as shown in the image below. White pearl picks are also very popular for weddings, since they look nice and can support a design with any color in it. Our white pearl picks are available in six gauges ranging from a very thin .38 to an extra heavy 1.26. There are also two different shapes available for white pearl picks; standard (left pick in photo) and rounded triangle (right pick in photo). Design your white pearl pick on our custom website today! I once owned a guitar shop, with a repair department, and replaced many guitar strings. Here are a few good tips, I would like to share with you. disengage it from the hole in the machine head. Work across the guitar repeating this procedure. This will place the least amount of stress on your neck and body. each string back into a circle, and lock loop with one end. Try to make the circle small enough to fit into the envelope, that your new strings will be removed from. In this way, everything is nice and neat, and there is less change of injury. 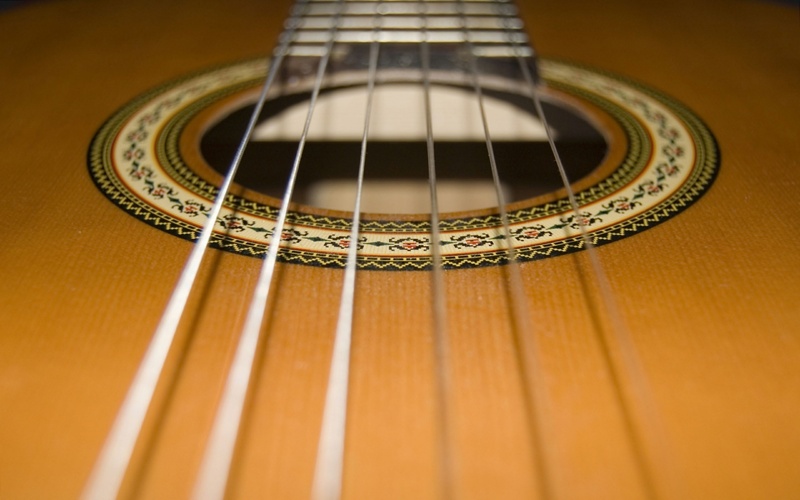 Now is the time to use your favorite guitar polish, and clean your instrument, especially around the sound hole. This is also the time to determine, weather your fret board needs conditioning. of build up, is unnecessary, and can lead to damaging your neck. Harsh chemicals will dry out the wood, and water tends to swell the wood. So, I just use a clean cloth and gently remove most of the grease, using the fret board conditioner. Leaving a little grease behind isn’t going to hurt anything. If you get to aggressive, and trying to remove all of it, you may do more harm than good. This is the time to find yourself a lead pencil. Before replacing your strings, take the sharp lead pencil, and rub the lead into the string slots on the top nut. This will add a little graphite, and help to release uneven tension when you tune up your guitar. Your guitar will stay in tune better. Un-package your new strings, as needed. Stay organized. Starting with the bass E string, place the end ball back into the saddle, and orient the slot in the peg to fit the string. Press the peg all the way down while pulling a little tension on the string, with the other hand. You are trying to find the end of your string ball, while pressing the peg into the hole. Take the other end, being careful, wind it around the machine head’s pole 2-3 times, rotating counter clock wise, on the bass side and clock wise on the treble side. After placing the end of the wire through the hole, pull it tight. Now, begin turning the machine head, placing more tension on the string. No string should be laying over another string. Check to see that the 2-3 windings are holding, and look correctly. Do this with all 6 strings. Using an electronic tuner or pitch pipe, slowly bring the bass string up to full note tension. Do this with all 6 strings. Don’t wast your time trying to tune each string. Relative pitch will work for now. 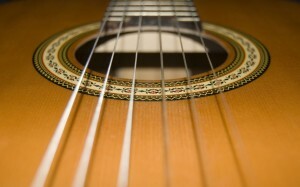 If your G string is a wrapped, be slow to bring it up to tone. It contains the thinnest core wire within the set and is the easiest to break. Worry about the G string, and then the top E string. Bring all of your strings up to tune, working your way from the bass to the treble. Using a good pair of small wire cutters, cut off the excess wire leaving 1/8′ outside the hole. Your new strings will not stay in tune, until they have had time to stretch out. If you don’t plan to play, tune it up, and leave it for a day or two, re-tuning when you have a chance. I have rarely done this, as I usually want to start playing. Additionally, I want my guitar to stay in tune, without constantly retuning… Here is a away, to help remove most of the built in slippage from your strings. Care must be taken, or you will break strings. As the strings become thinner, you must use less pressure. With your guitar fully tuned to E, place it horizontally on a padded table top, and/or your lap with the bass string nearest you. Grasp the bass E string with both hands. The wire should be between your four fingers and your thumbs. Hands spread apart, with approx. a half inch space between your two thumbs, start bending the string. Pull with your fingers, while bending in the opposite direction. Do this moving up and down the neck. You are working the bindings. You should be very careful bending your G string, especially if it has an outer wrapping. This is the string, which will always break first, until you learn this technique. Turn your guitar around now, and do the same thing in the opposite direction, starting from high E to low E. Once you have learned this technique, you will be likely use it, as it makes a huge difference in the time it takes to keep your guitar in tune. It might be wise, to purchase an extra single G and E string. In the beginning, your G,B, and high E, are the strings that break most frequently. I have been playing guitar consistently for over 35 years, and haven’t broken a string in 20 years. Though in the beginning , I broke them on a regular basis. Remember, take care and be careful. Try to stay organized, you and your guitar will experience less stress. Above all have fun. Category: Guitar Accessory Tips, Miscellaneous, News Clayton, guitar picks, guitar strings, steve clayton inc. Looking to add some variety and warmth to your custom guitar picks? Try switching your design color to brown! Lately we have noticed some very nice brown designs being submitted by our customers, and we wanted to show them off. If you are creating a custom design for our colored picks, you are limited to using black only, but if you are working with any of our white picks, or our ultems, you are open to a whole new set of color choices! Shown in the image here are a white delrin pick, an acetal pick, an ultem pick, and another acetal (left to right). The design on the white delrin is a full color, full bleed design, which means that the design runs all the way to the edge of the pick. 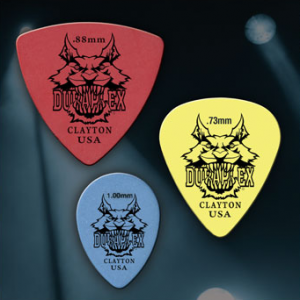 The acetal picks represent both a full color and single color design. The ultem is a great example of how a brown design can look great against the tan color, since ultems may have black, red, and/or brown printed on them. So, if you are thinking that black is out and brown is in, try your custom design today at www.claytoncustom.com! Are you looking for a bright pick that will catch people’s attention? Or maybe you just want a very specific color for your guitar picks? Give our colored pearls a try! 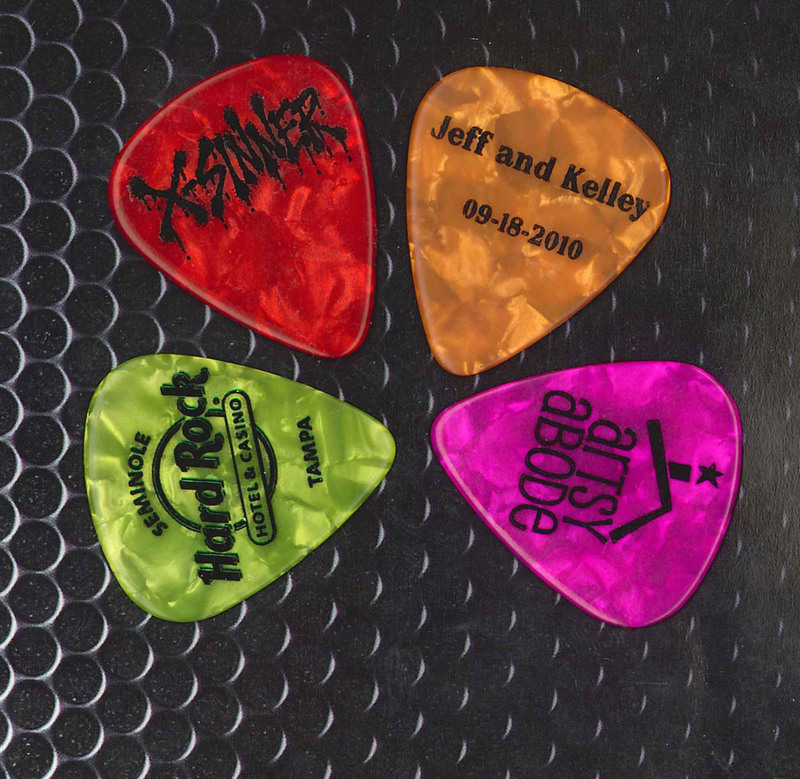 We offer colored delrin custom guitar picks, but sometimes we find that customers are looking for a very specific color that is not available in delrin. Also, the colors of the delrins are dictated by the gauges (for example, red = .5mm gauge), but sometimes someone is looking for a color of pick in a different gauge than the one offered for colored delrin. This is when we recommend the colored pearls because they come in a very wide variety of colors, and several gauges. For our colored pearl picks, we offer .3, .5, .63, .8, 1, 1.26, and we have both standard and rounded triangle shapes. Colored pearls make great wedding picks, because they can be matched to the color scheme of the wedding, and they have a classy, marbleized look. Design your custom colored pearls today…but don’t forget to make sure that your design is in black ink only!! Custom Design Site. Sometimes at Clayton, Inc., we get a custom pick design that comes out so well, we just want to show it off! Here is an example of one of these designs. 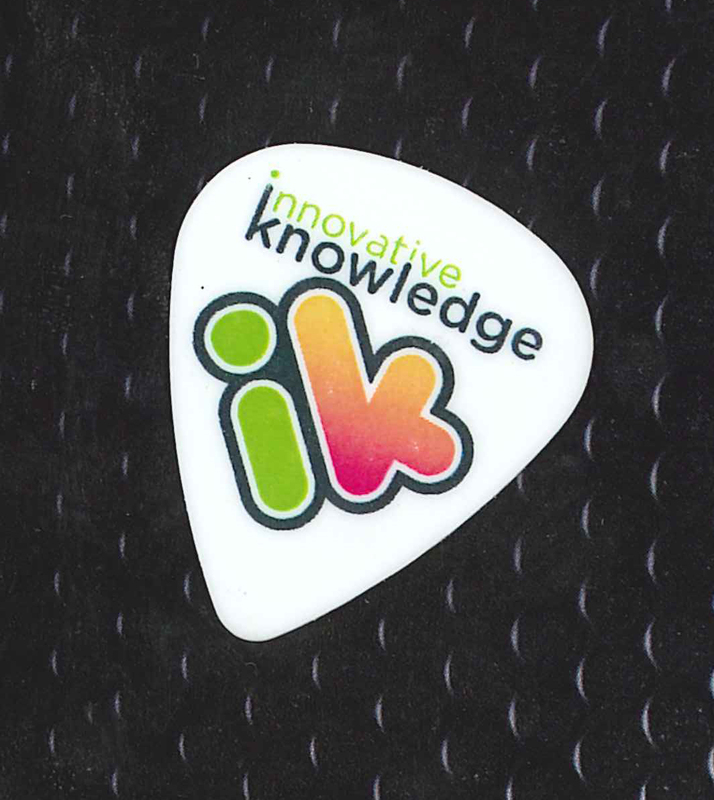 This design is for a company called Innovative Knowledge, and we love the color scheme of the artwork. 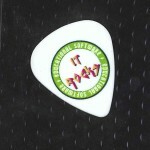 On the front of the pick is the company name with the logo that they use, and on the back is a two-word description of the company (educational software), and the slogan that ties the company with these guitar picks: “It Rocks.” This is a perfect example of how a non-music related business can still effectively use guitar picks as a promotional item. They also did a great job at including the information about the company that they wanted without filling up the guitar pick with too much tiny text. This design was placed on our white delrin picks, which was a perfect choice. The bright white of the white delrin material is best for making bright colors, such as those in this design, really pop out. Delrin is also recommended over acetal picks if the design is two sided, because the white delrins do not have any transparency. White delrin picks are available in three gauges: .8, 1, and 1.26mm. They are only available in standard shape, but they can have single or full color printing. Show off your awesome design skills by working with our custom design interface at www.claytoncustom.com. For fans of all kinds signatures are always something to collect. Some artists will actually sign their guitar picks at shows while many others will have them made on their custom guitar picks. A lot of signatures have been placed on our white delrins as you can see in this photo the white delrin brings out the signatures the best. 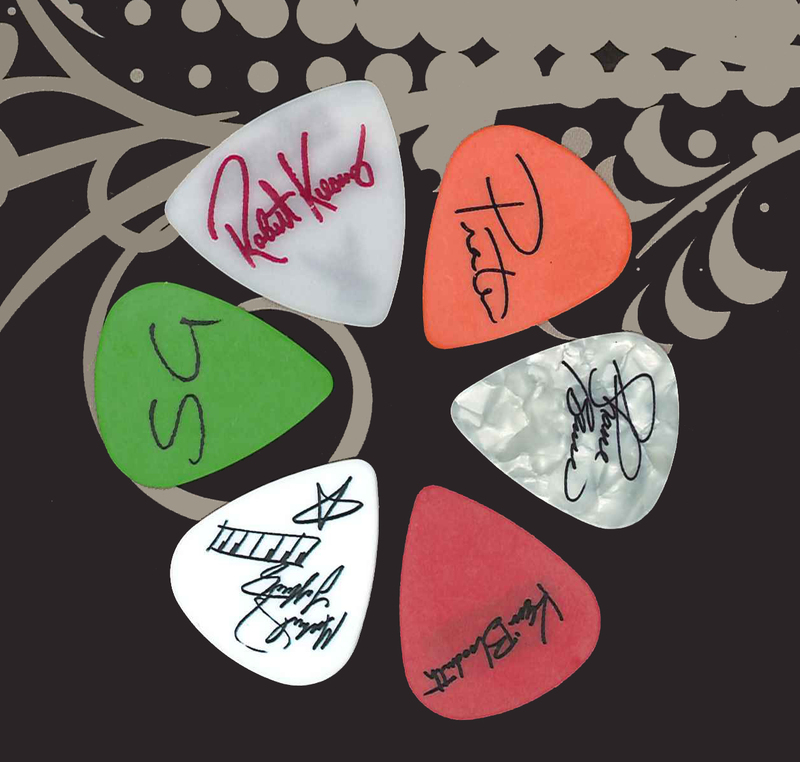 The great thing about our designer is you can easily adjust the size of your own signature to the picks. Just scan your signature, save it on your computer and then place it on your favorite custom guitar pick. I’d also suggest using a marker to make the signature standout. 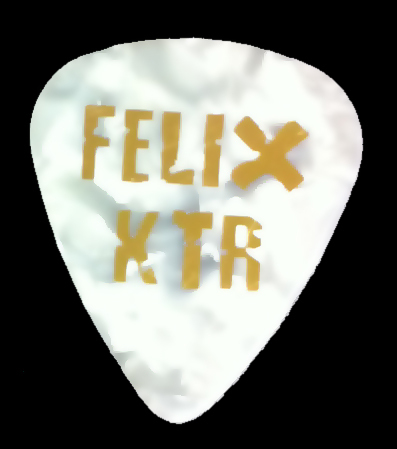 Make your custom guitar picks today! Rock Star Lesson On Custom Guitar Picks!